At age twenty-five, after serving in the French navy for seven years, Albert Roussel (1869–1937) decided to become a musician and sent a letter of resignation dated 14 June 1894. Four years later he entered the newly established Schola Cantorum, where he studied under Vincent d’Indy. In 1902, d’Indy entrusted him with the counterpoint class, which he taught until June 1914. Roussel and his wife of a year set sail in 1909 on a three-month voyage to the Indies and Cambodia. The result of this tour was the splendid set of three Évocations, op. 15 (1911) and the opera-ballet Padmâvatî (1919). The opening of the last movement “Aux bords du Fleuve Sacré” conjures up night falling over the banks of the Ganges, as is made clear by the text of the following chorus entry. In the next section the sopranos describe couples embracing in the moonlight, accompanied by the vowel “A” in the other voices (mm. 88–95). This is followed by a passage for the full chorus singing “A” (mm. 98–117), then “Au” (mm. 118–139). The musical material in the chorus at times is highly reminiscent of Debussy’s Siren theme—the undulating women’s voices moving by step in alternating duple and triple subdivision. Immediately preceding the entrance of the solo tenor, the music once again seems to evoke Debussy’s “Sirènes,” especially the soprano part in measure 139. The tenor, accompanied by wordless women’s chorus, delivers the short phrase: “Mais les parfums de la nuit déjà réveillent dans les c œurs l’amour” [“Yet, already, the fragrances of the night are awakening hearts to love”] (mm. 140–45), before the chorus launches into an extended developmental section of pure vocalization (mm. 145–212), alternating between the vowels “A” and “Au.” The wordless chorus creates an atmosphere of warm voluptuousness, and the music rises to a passionate climax. Following the extended choral passage, the solo tenor sings of couples embracing in the moonlight, wandering under the leaves, and throbbing with happiness (mm. 213–19), again accompanied by wordless women’s chorus. The following contralto solo follows the tenor’s lead, but now switches to a first-person perspective, accompanied by wordless chorus (ATB) (mm. 241–51). This is followed by the chant of a fakir, an ecstatic chant heralding the break of day (mm. 281–324), followed by a grandiose, solemn hymn to the sun (mm. 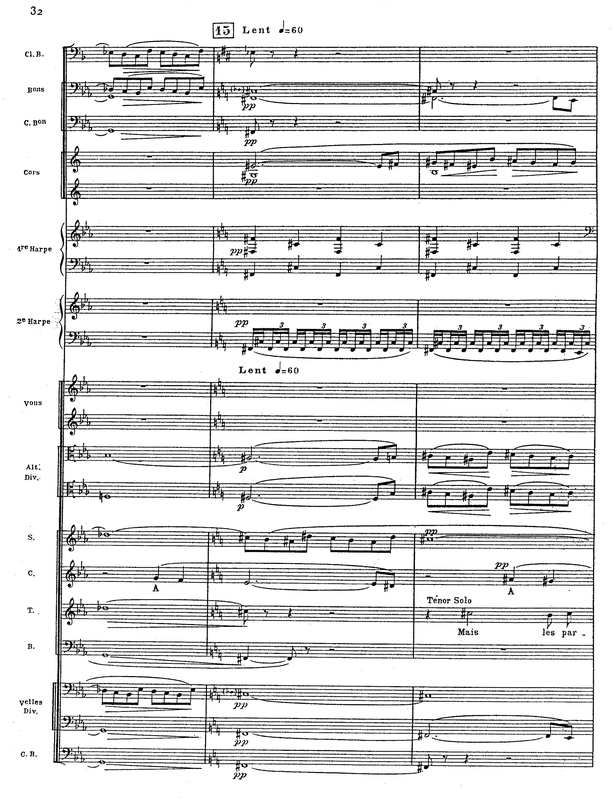 332–97).4 In the few closing bars, with consummate skill the composer reintroduces peace and silence on a pianissimo held by the choir and punctuated by the orchestra. 1 Basil Deane, Albert Roussel (London: Barrie and Rockliff, 1961), 61. 2 Michel-Dimitri Calvocoressi, Music and Ballet (1934; repr., London: Faber and Faber, 1978), 58–59. Calvocoressi had previously translated from Greek to French the text for Ravel’s Cinq mélodies populaires grecques (1904–6). He was also the principal French adviser to Diaghliev when the latter was introducing Russian orchestral music, opera, and ballet to Paris (1907–10). 3 Norman Demuth, Albert Roussel (1947; repr., Westport, CT: Hyperion, 1979), 50. 5 Albert Roussel, Évocations: Aux bords du Fleuve Sacré, op. 15, no. 3 (1912; repr., Miami, FL: Kalmus, 1988), 32.